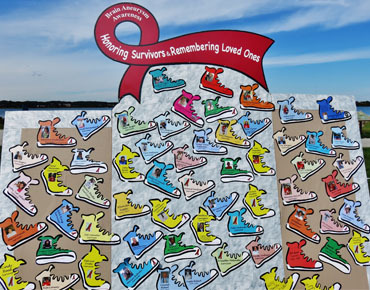 The 9th annual KAT-Walk & Karo-5K is in honor of Kimberly A. Tudor and Karolina Kurka. Both young ladies passed away from sudden ruptured brain aneurysms. The event has now grown to include many more families affected by brain aneurysms. The day is also used to honor survivors and remember loved ones lost to this often undetected silent killer. Join hundreds of runners and walkers as we enjoy the course along Portland's ocean side Back Cove Boulevard. We start and return to the Preble Street parking area across from the Hannaford Plaza. 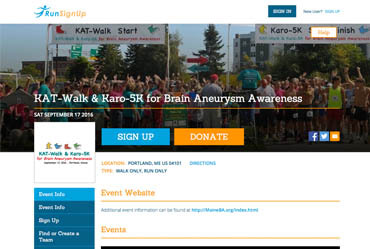 CLICK HERE for directions and map to KAT-Walk & Karo-5K. ON-LINE REGISTRATION is encouraged, guarantees a T-shirt, and IT'S EASY. Runners: $20 registration fee includes T-shirt for the professionally timed 5K race. Walkers: $20 registration fee includes T-shirt or join us at the event with a free-will donation. 11:00 to 12:45: Onsite Registration and activities including family gatherings, Brain Aneurysm Awareness information, a 50/50 raffle, and face painting. This is a great opportunity to meet and support other families affected by brain aneurysms. Bring a picnic and enjoy the cove. 1:00: The timed and measured Karo-5K will kick off and follow an "out & back" course on the boulevard pathway. Prizes and thank-you medallions will be awarded to top runners in age groups. 1:05: The KAT-Walk will follow the runners. Enjoy a leisurely walk along the shorter 2 mile course along the boulevard's oceanside pathway. Controlled pets are welcome to join us. 2:15: Runners awards and closing ceremonies. "Share our tears, remember with love, and walk & run to honor." Download and print the 2017 poster and help promote the event.